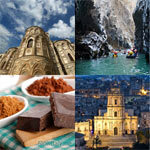 Authentic “institutions of hospitality”, the historic coffee houses of Italy allow you to sip a coffee while contemplating the stylish interiors of the temples of the cultural and political scenes of the 1800s and 1900s. 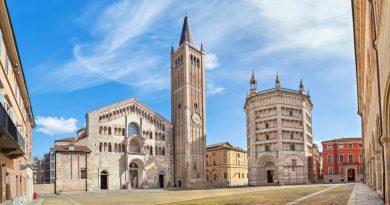 The events they have witnessed and memories left by illustrious visitors let you travel back in time enjoying the historical heritage and traditions of Italy. 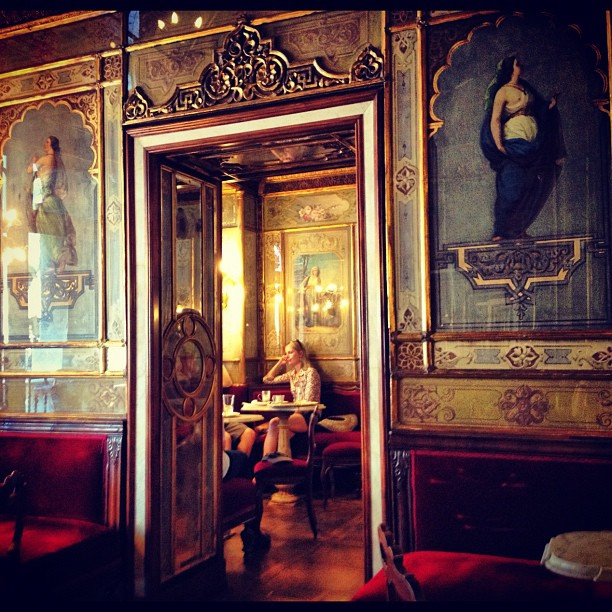 One of the oldest cafes of Italy in continuous operation, Caffè Florian represents the essence of Venice. Frequented by Lord Byron, Goethe, Rousseau, Gozzi, the Enlightenment satirist Giuseppe Parini, the writer and poet Ugo Foscolo and the poets and patriots Silvio Pellico and Giovanni Berchet, it was also here that Casanova courted his ladies. During the insurrection against Austria in 1848, revolutionaries chose Caffè Florian as their headquarters, and it was here that the conspirators demanded the liberation of Niccolò Tommaseo and Daniele Manin, who proclaimed the rebirth of the Republic of San Marco. 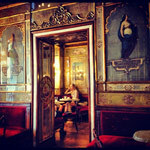 Originally called Caffè alla Venezia trionfante, the coffee house soon became known as Caffè Florian, after its original owner and founder Floriano Francesconi. The flamboyant halls and decoration are still evocative of the traditional charm, created by Francesconi. Caffé Gambrinus is a literary cafe with magnificent belle époque-interior. Gabriele d’Annunzio wrote the text of de Neapolitan song A vucchella here. 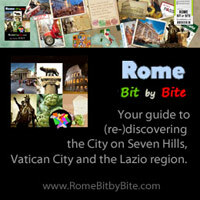 At the end of the 19th century it was the intellectual and political center of the city. Benedetto Croce, one of the main Italian Hegelian philosophers and most active antifascists intellectuals met here with other intellectuals, journalists and politicians who were active on the cultural scene of those years and chose Gambrinus as their meeting place. 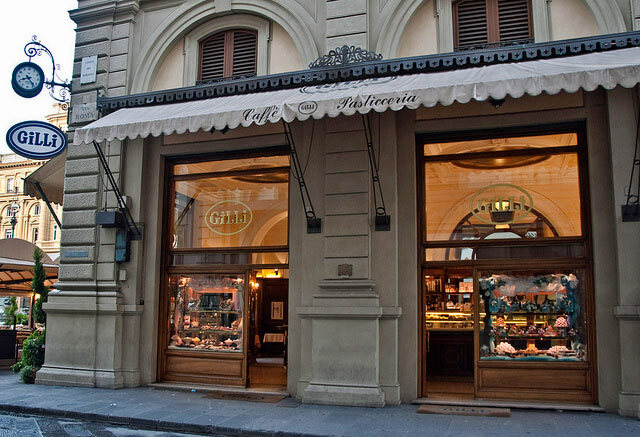 In 1733, the swiss Gilli family opened the Bottega dei Pani Dolci (The sweet breads Boutique) on Via de’ Calzaiuoli, which soon became a favorite among the florentine well-to-do. In the second half of the 19th century Gilli moved to Via degli Speziali, right in font of the famous Trianon, where it was patronized by Lina Cavalieri and Fregoli. 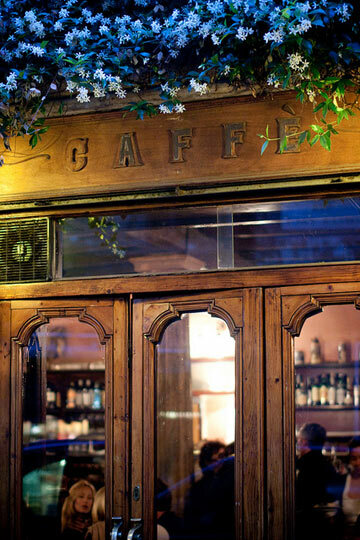 At the beginning of the 1900’s Caffè Gilli moved to its current location, Piazza della Repubblica, then called Piazza Vittorio Emanuele, where intellectuals and journalists of La Voce used to meet. 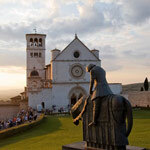 It soon became a meeting place for artists such as Doni, Calignani, Pozzi, Polloni, Ferroni e Pucci. After the world wars the coffee house became an exclusive haunt for young florentines as well as for the first tourists who came to the city. 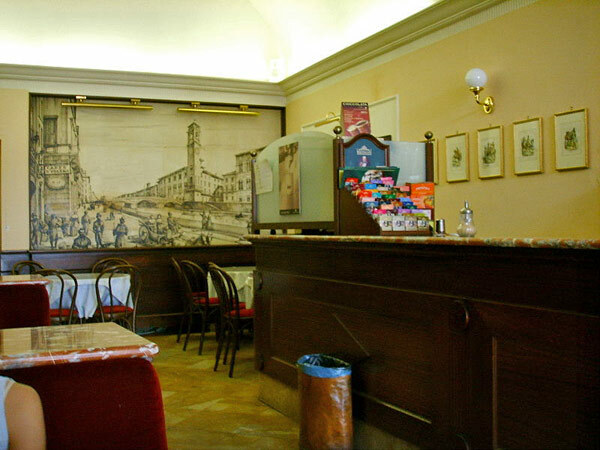 Founded in 1846, Caffè Paszkowski is another florentine coffee house which to this day is still a favorite hangout of intellectuals. Giovanni Papini, Ardengo Soffici, Gaetano Salvemini and even Cesare Battisti, were some of the guests of the past. Situated on the vast Piazza della Repubblica, next to the Gilli, the Paszkowski was declared a national monument in 1991. 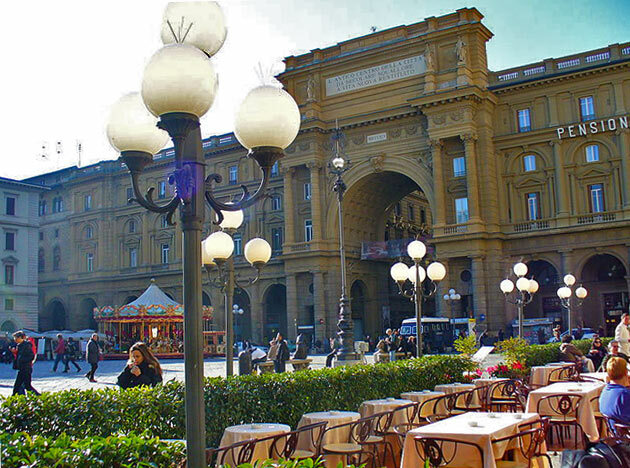 The coffee house perpetuates the tradition of chanteuses entertaining the guests with songs, a custom that was particularly popular at the golden age of florentine literature. 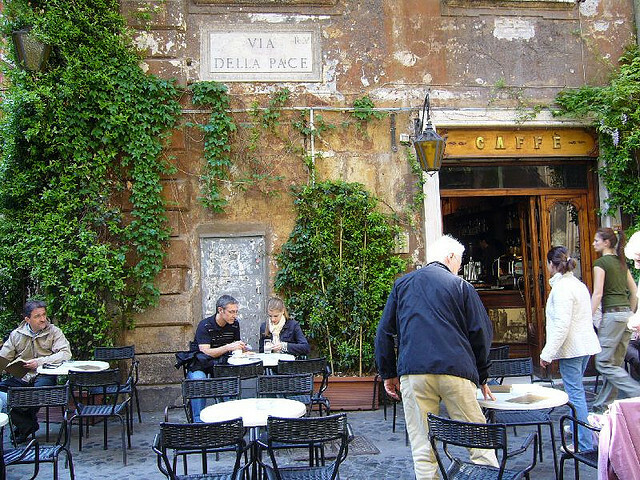 Located near Piazza Navona, this coffee house includes three charming little rooms in a mixed style of Baroque, Empire and Art Nouveau. 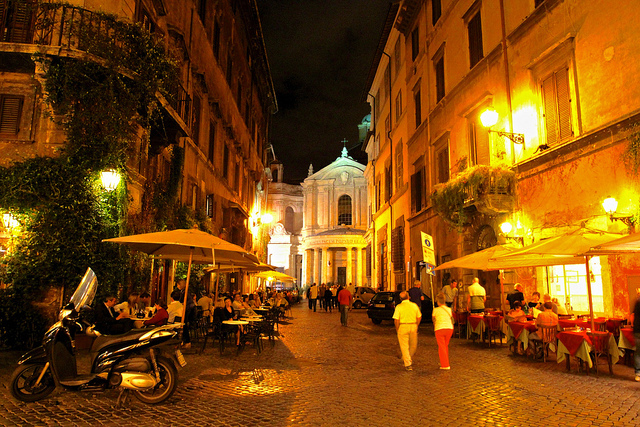 The outdoor tables overlook the beautiful square and church Santa Maria della Pace and people from all walks of life like to stop off here at day or night to have a coffee. 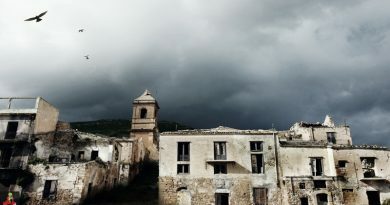 A favorite haunt of painters, writers and artists, it was also here that the art movement Transavanguardia (transavantgarde, literally meaning “beyond the avant-garde”), was coined by the critic Achille Bonito Oliva and led by painters such as Enzo Cucchi, Sandro Chia, Francesco Clemente and Mimmo Paladino. The art movement rejected conceptual art and sought to reintroduce emotions back into the visual arts. 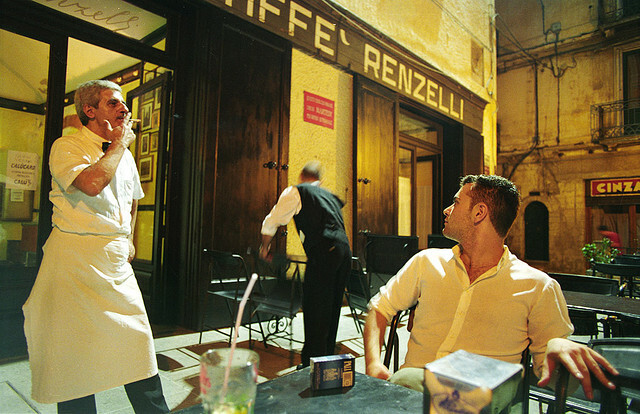 Caffè Fiorio was the favorite coffee house of Cavour, Rattazzi, and D’Azeglio. 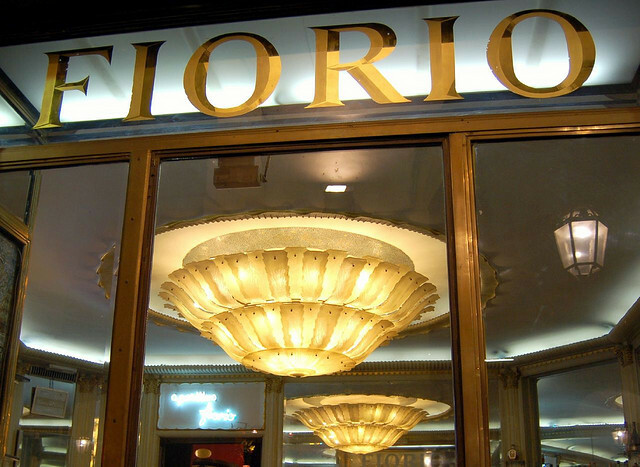 It is said that Charles Albert, King of Piedmont-Sardinia, before starting his morning audiences, used to ask: “What did they say at Fiorio’s?” because it was the meeting place of the most influential thinkers. 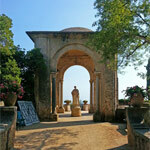 Nietzsche also used to visit the place. 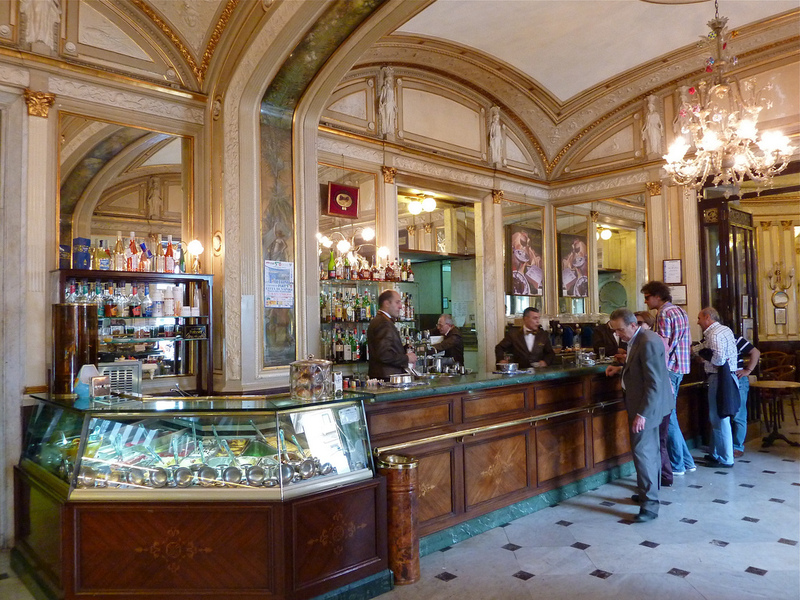 Read more about Caffé Fiorio and other historic Turinese cafes: best historic cafes of Turin. This historical café has been in the same family for seven generations (it was founded more than two hundred years ago). A meeting place of patriots, it was here that Domenico Frugiuele and Gianfelice Petrassi fomented the revolt against the Bourbons on 9 March 1844 and decided to proclaim a constitutional government. 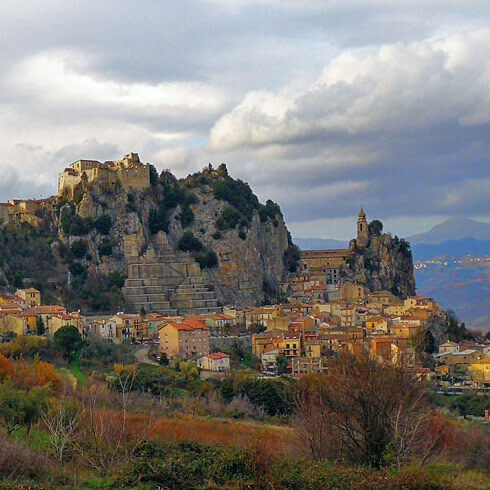 It was also from here that food was sent to alleviate the imprisonment of Attilio and Emilio Bandiera, known as the Bandiera brothers, the two Italian patriots who were sent to prison upon betrayal by informants. 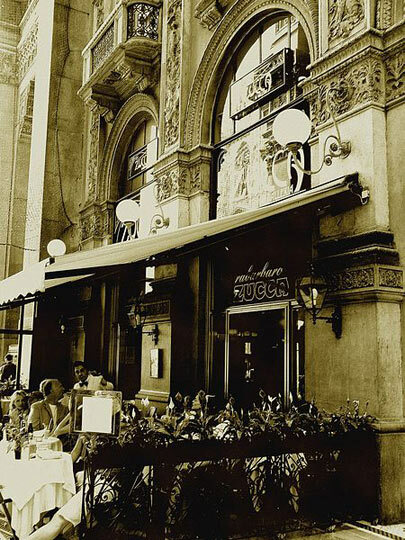 Famous for it specialties of Neapolitan and Catalan origin, the coffee house, being close to the Rendano theater, is also popular as an after-theater café. Located in Piazza Corvetto at the end of one of the most elegant streets of Genova, Via Roma, Caffè Mangini has always been a meeting place for journalists, writers and artists. Legendary editors such as Cavassa and Pertini were habitués here. 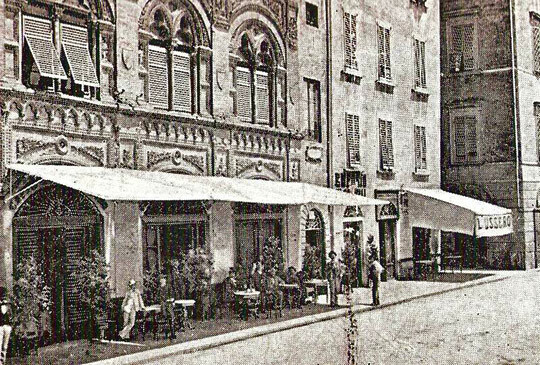 This very old café, frequented by Giacomo Pucini and many foreign artists, was originally known as the Antico Café del Caselli. 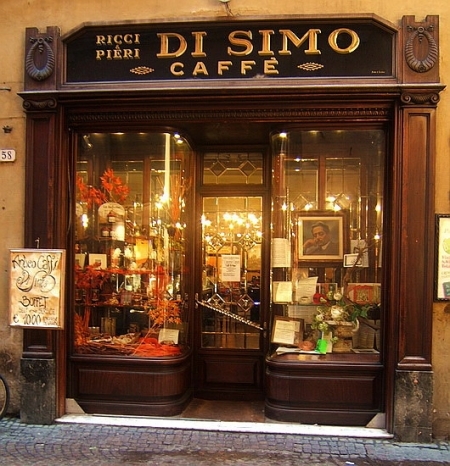 Later on it was renamed Cafè Di Simo but the original furnishing and decoration in Liberty style were preserved, as were the numerous souvenirs of famous visitors. 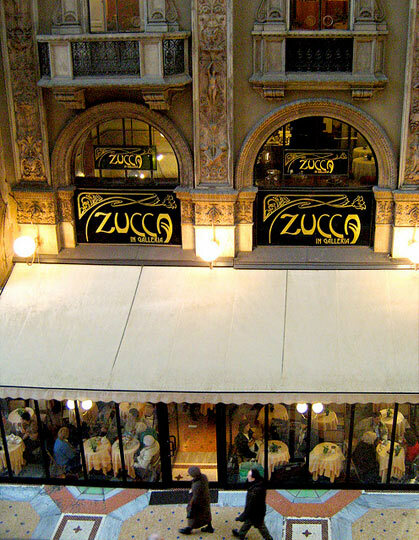 Inaugurated in 1867 at the same time as the Galleria Vittorio Emanuele, caffè “Zucca in Galleria” is iconic of Milan and its history, tying the culture of the Galleria to that of the Scala theater of Milan. 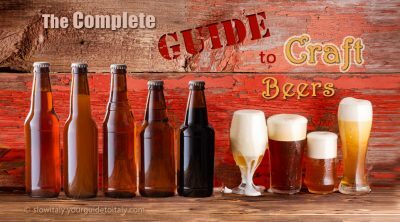 Giuseppe Verdi, Arturo Toscanini, Puccini, Arrigo Boito and Giuseppe Giacosa would all come here to meet with other artists and intellectuals and have a drink after the show at La Scala. 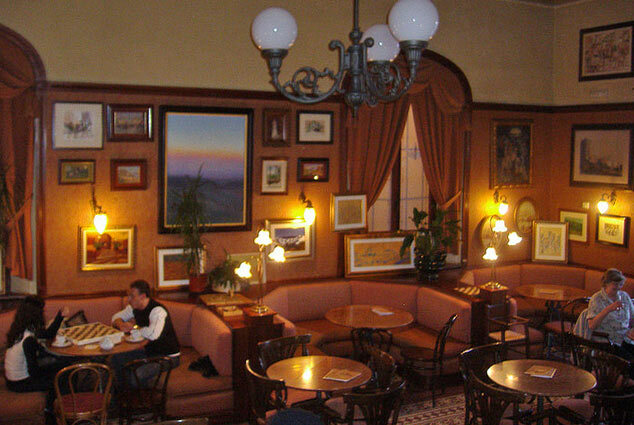 The coffee house was frequented by many famous and influential people of the past, such as the Italian premier Zanardelli, Eugenio Torelli Viollier (the co-founder of Il Corriere), the politician and poet Cavallotti, and the publisher Giulio Ricordi. The monument of Liberty-style is said to have been also a favorite of King Umberto I and Edward VII of England who enjoyed to have a Bitter at the wood inlaid bar, crafted by Eugenio Quarti. 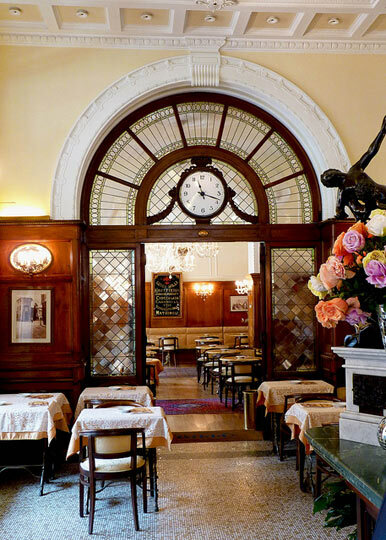 The original liberty decoration, with its prestigious chandeliers and refined liberty mosaics with cascades of multicolored flowers and birds by Angelo d’Andrea, has been respectfully preserved by the current owner, Guglielmo Miani, who bought the coffee house in the sixties. 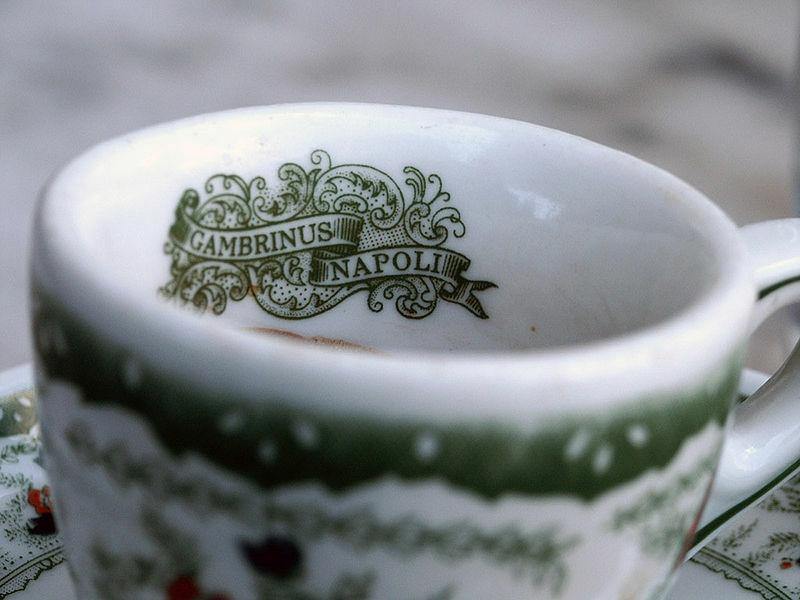 Caffè Nazionale is housed on the ground floor of a beautiful neo-classical Palazzo that also accommodates the Municipio (town hall) of Aosta. The coffee house includes an impressive circular Gothic hall, a vestige of the Convent of St Francis – built by Amedeus VI of Savoy in 1352 – on which ruins the Palazzo was built. 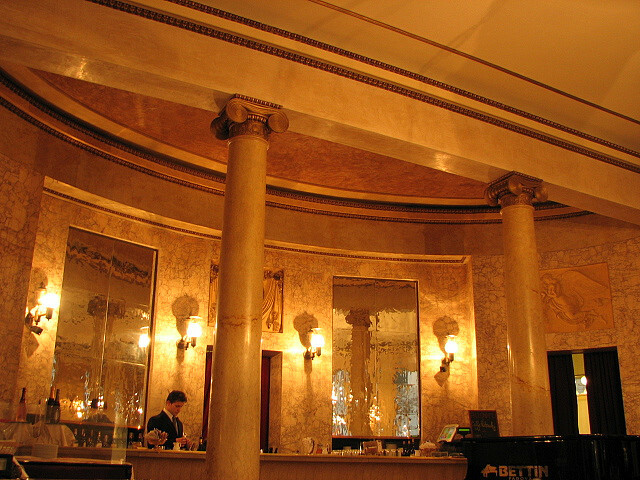 It was in Caffè Nazionale that the first film showings of the 20th century were screened. But even before, in the 1800s, the coffee house staged artistic performances, such as dance shows typical of the Belle Epoque. Scenes of a movie of the 1930s featuring two film stars of that time, Alida Valli and Amedeo Nazzari, were shot inside the prestigious coffee house. Celebrities like Ava Gardner and King Farouk of Egypt were regular visitors here, as were the left-wing politicians Pietro Nenni and Palmiro Togliatti who organized political meetings in this historic place on Piazza Chanoux. 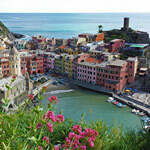 Founded in 1476, Caffè del Tasso is one of the oldest establishments in Italy. During the Renaissance it was known as Locanda delle due Spade (the “inn of two swords”), but in 1681 the inn took the name of the poet to whom Bergamo dedicated the nearby statue and became Torquato Tasso Caffé e Bottiglieria (Torquato Tasso Café and Wine shop). 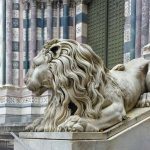 Located on the prestigious Piazza Vecchia (which Le Corbusier called one of the most beautiful squares in the world, the caffè was frequented by musicians, artists, writers and famous people visiting Bergamo. Kokoschka, Manzù, Gavazzeni, Benedetti Michelangeli all loved to have a coffee here. 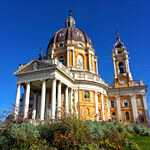 In 1859 it was here that local volunteers signed up to become part of Garibaldi’s Thousand. 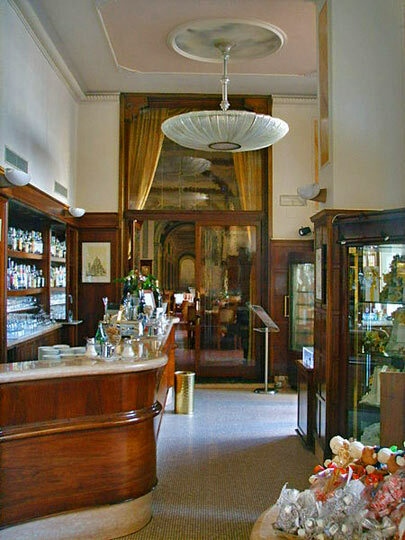 In the second half of the Nineteenth century, the coffee house was renovated in neoclassical style and renamed Caffè del Tasso. 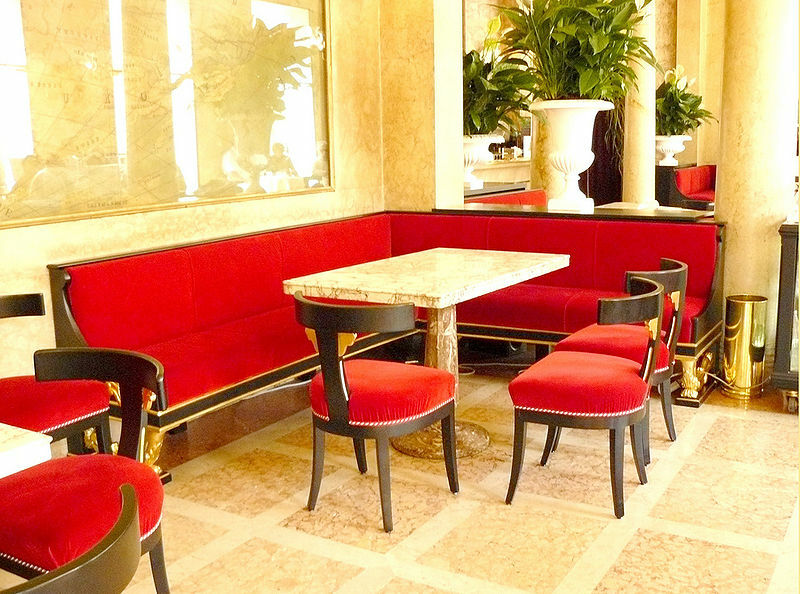 This delightful, elegant café-restaurant in Art-Nouveau style is located in the heart of the old town. It has been a cultural and intellectual hub since 1800, frequented by poets like Carducci, Pirandello, Prezzolini and Malaparte. 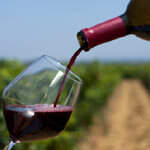 Visitors from around the world come to enjoy the finest, traditional Tuscan recipes and the beautiful view over the Valdichiana. Caffè Pedrocchi is architecturally interesting because it was created from different buildings and facades which were integrated into a single, eclectic ensemble. 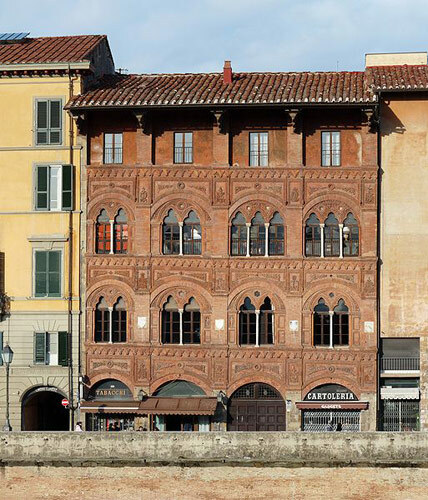 Founded in 1831 by Francesco Pedrocchi, the coffee house was expanded by his son Antonio and the Venetian architect Jappelli to include the entire block. 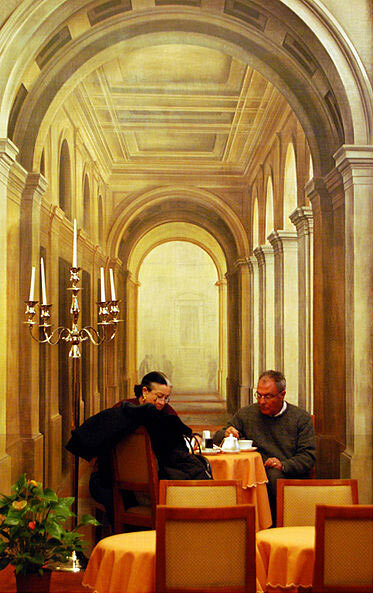 Housed in the fifteenth-century Palazzo Agostini, on the Lungarno, Caffè dell’Ussero counts some illustrious patrons who came here as students: Giosuè Carducci (the first Italian Nobel Prize laureate), Filippo Mazzei (an Italian-born patriot and close friend of Thomas Jefferson from who inspired the great doctrine “All men are created equal” and incorporated into the Declaration of Independence by Jefferson), Alessandro D’Ancona (first director of the newspaper La Nazione), Giuseppe Giusti (who made the café famous in his Memorie di Pisa of 1841), Cesare Abba, Indro Montanelli, among many others. In 1839 it hosted the meetings of the first Italian Congress of Scientists. The name of the coffee house derives from the Toscan and literary variant of the Italian word ussaro (from the French word hussard: a soldier in a light cavalry regiment, originally an hungarian military term. 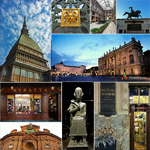 Photo credits (top to bottom): caffè Florian by Maria Rosaria Sannino; caffè gambrinus by Martha de Jong-Lantink; Gambrinus cup by Giorgio Montersino; Caffè Gilli by Eric Parker; Caffè Gilli by Lorenzo L.; Caffè Gilli by Freepenguin; caffè Paszkowski by Nevertime; caffè Paszkowski by Sailko; cafè della Pace by frankypang; caffè della pace by Paul d’Ambra and oemebamo; caffè Fiorino by loungerie; ; cafe Renzelli by Castellucci Pietro; caffè Di Simo, source: lagazzettadilucca.it; Caffé Zucca by Chiara; Caffè Zucca by Deskmir; café Poliziano by sp!ros; cafè pedrocchi by rionda; caffè Pedrocchi by fabiola, caffè del Ussero by Locarelli and Sailko. 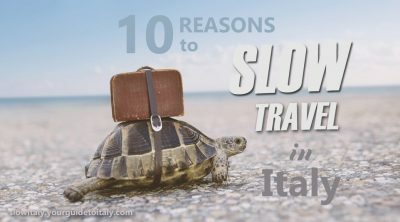 My daughter and I are visiting Italy later this year and I have never been outside Australia, so I am really looking forward to visiting the smaller trattoria and getting the feel of the country, away from the tourist areas.